Engineered to exceed the expectations of the professional electrician the Sperry Instruments DM6250 7-Function Digital Multimeter offers a durable and ergonomic design manufactured to the latest industry standards. Featuring improved audible and visual indicators, a large LCD screen, and easy to read industry standard markings this unit uses standard AAA batteries with an auto-off function designed to save battery life. Unit is equipped with auto ranging capabilities that allow the meter to automatically determine the resolution based on the application without requiring manual adjustments. This multimeter is compact, lightweight, and features impact resistant ABS housing with protective rubber overmold and comfort grip. 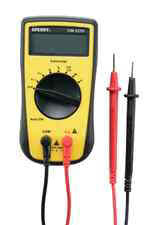 AC 500V/DC 600V capable with temperature (probe type) measurement functionality. Unit also measures resistance and continuity (audible), and performs diode and battery testing (1 Range - 1.5V (2V)). CAT III, cETLus and CE rated with a 5 year warranty to give our users the peace of mind they deserve. Requires 2 AAA batteries for operation (not included).